Austrian sculptor. He was a poor peasants son who was apprenticed to a village sculptor in the Allgäu region. 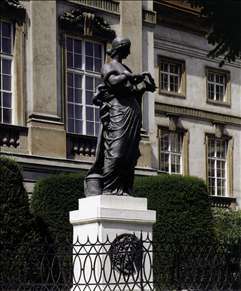 He then worked in Vienna for ten years as an assistant to the sculptors Anton Tabota (1724-76), Jakob Christoph Schletterer (1699-1774) and Franz Xaver Messerschmidt. At the same time he studied at the Akademie der Bildenden Knste. His first independent works, dating from the mid-1770s, include a statue of Mucius Scaevola (marble, 1773) for Schnbrunn Park, and two side altars (1775-76) for the cathedral in Pcs. It was not until the 1780s that Fischer became a recognized and sought-after artist in Vienna. His oeuvre is very varied: working in metal and stone, he created figures of saints, such as the Four Evangelists (sandstone, 1781) for the high altar of the Michaelerkirche, as well as park statues and sculptures for buildings and tombs. Later his output of portraits and fountain statues increased in number and importance. To support his membership application to the Akademie der Bildenden Knste in 1785, he submitted an corch figure, demonstrating his interest in anatomy. The following year he began to teach at the Akademie, starting as Professor of Anatomy and assistant in the sculpture class; he became Professor of Sculpture in 1806, succeeding Franz Anton Zauner, and was elected Director of the Akademie in 1815. See more details about "Hygieia"